Hope you've had a great week! I am in major countdown mode...in just 8 days I will be off for Spring Break! Woohoo! 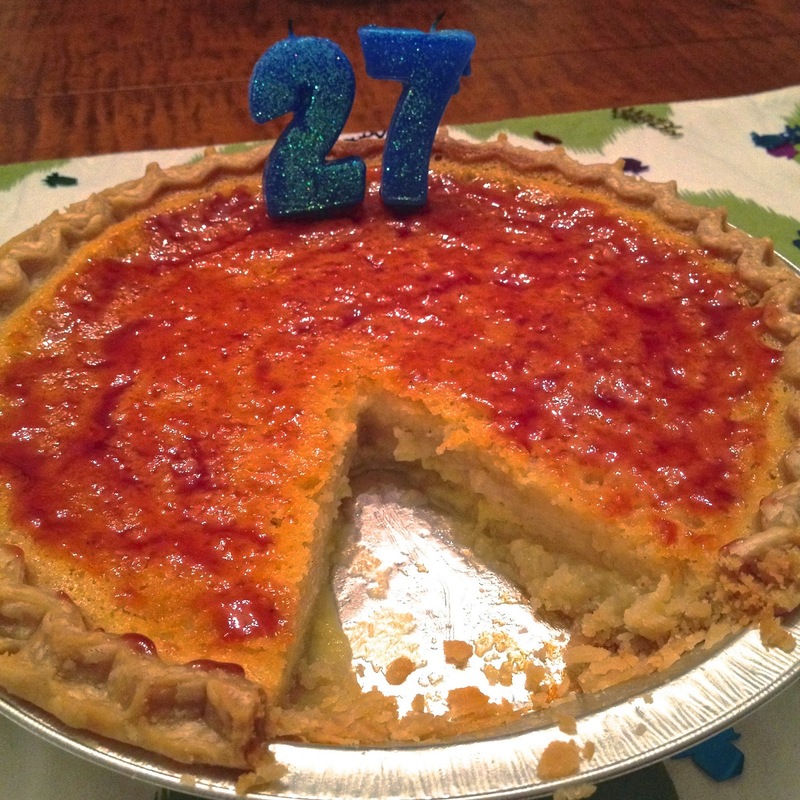 As y'all know, last week was Bryce's birthday and he requested that I make him a buttermilk pie. I had never heard of the dessert, but my research showed that it is actually a very Southern dish. Having never made it before, I wanted to be sure to find a good recipe and ultimately found two that sounded tasty, so I decided to combine them into my own unique recipe. We really enjoyed the pie. It was light and a custard-like with hints of lemon and nutmeg. The recipes I used for inspiration can be found here and here. Mix sugar and flour well and add to eggs, mixing until creamy. Add melted butter, mixing well. Add buttermilk, lemon juice, vanilla extract, and nutmeg. Bake at 325F for ~1 hour, or until custard sets. The custard should jiggle a bit, however, the middle should not jiggle much more than the sides. If so, return to oven and bake until the custard has set. Pour strawberry preserves in saucepan over medium heat. Stir constantly with whisk, until smooth. Remove from heat and add liqueur. Have you ever had buttermilk pie before? What are your favorite Southern desserts? I've never had this before! I like how light it sounds. Yum! There was a whole spread on buttermilk desserts in Bon Appetit last month. I haven't had one before but this looks amazing. The only pie I bake is key Lime. But this sounds delicious...and I recall seeing this in an Amish?Penna Dutch cookbook. This sounds so delicious and I happen to have a gluten free pie shell waiting for a recipe this delicious to come along! Happy belated birthday Bryce! I didn't notice until you posted about buttermilk pie but it's in one of our boys' books - Bubba and Beau Meet the Relatives. Truly a southern read (if you can't tell from the title). I love key lime pie - does that count as southern? This sounds like a pie that I made last year but mine called for bourbon. I really like the idea of the strawberry drizzle. I bet it would even be good on some vanilla ice cream! That pie looks amazing! Wish my hubby liked sweets as much as me because if I make it I'll be the only one eating it! soo adorable and that pie looks delicious! I will have to try the recipe for my next dinner party! I've never heard of buttermilk pie before! It looks/sounds delicious though!! :) We are off for Spring Break from April 11-20! :) Yay! Ooh you used the Joy the Baker recipe! I hope it was good! it looks yummy. I need to try this pie. I've never had one but they look scrumptious.